My morning spinning routine is paying off. 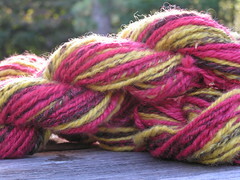 I have managed to spin and ply another of last year’s Rhinebeck purchases! In my mind this will free me up for some guilt free spending at the festival this year. Last year I had a strategy to try and break out of my typical color choices. I would say that my weakness with both my knitting and my spinning lays in my color spectrum or lack thereof. I gravitate towards the same colors over and over again and have trouble seeing how a touch of a more vibrant color will set a whole different tone for the yarn and the project. With that being said, I still don’t like this yarn! I need to see it knit up – maybe then that yellow and fuscia will work themselves into some kind of peaceful accord. There are a few crosshatch scarf patterns out there and that type of stitch pattern could be just the thing. if you can’t laugh at your friends, it’s not worth having them. I happen to have some BFL on the wheel right now and that stuff is like butter! Do you know that Spin Out is this weekend? Cara has been hard at work organizing this event – and the raffle prizes are even more spectacular this year! The weather reports are also looking promising. Check it out and join us! Even with the deluge of rain last year it was tons of fun. What do you think about the new digs? I am seriously loving this WordPress site and as soon as I can corral Boar into helping me map my domain name, I will make this move official ……. I like the new look! Very cool! LOVE IT! Not the yarn…the new blog. Stop with the Rhinebeck stuff….I’m in mourning…waaaahhh!! I love the new look – oh, and I DO love the yarn colors. Can’t really judge the feel however! Very nice. I’m re-doing my digs this morning too. Although I’m not doing a move or anything. Just sprucing up! Love the look, but how could you not love little pigs all lined up in a row? I like your new site! I’ve been trying to spin down my Rhinebeck purchases to prepare for this year, too. I love the new look, very soothing to the eyes :) Now I want a wordpress blog! I love the BL yarn, it looks very Noro-ish to me. Very pretty! Nice new digs! If nothing else, Ravelry slapped me in the face with my predictable color choices, can you say green, green and more green? So I tried to mix it up and now I’m in a blue/pink rut! Ah, wordpress! The blog looks fab! Your new blog looks really nice! and I like the colours of the yarn too. I love the new digs and am a wordpress fan myself. Awesome new digs! I can’t seem to find the time to get my blog off of Typepad and onto WordPress. Three cheers for PurlingSwine.com! I am so confused . . . but what is new this year. Love the new look but now I must remember to update the bloglines. And I hear you about breaking out of color ruts; everything I knit is green or red. Have fun at Rhinebeck. I think the girls are taking us on a college-looky-at-it weekend . . . damn children. What is there problem! I love the new place. Change must be in the air because I just recently gave my blog a face lift. Your change is good! I love your the pigs and photos. Now that I am spinning – two 2 days must be spent at Rhinebeck ! My sister and I are staying at my daughter’s in Albany . Need to save up money and find more space. If only I could knit faster..